Keep Your Entire Workstation Clean By Stowing Commonly Used Items In This Hon 26"W Laminate Center Drawer. The Drawer Glides 12" On A Smooth Ball-Bearing Suspension To Give Easy Access To All Contents. The Integrated Pencil Tray Allows You To Organize Personal Items And Utensils. 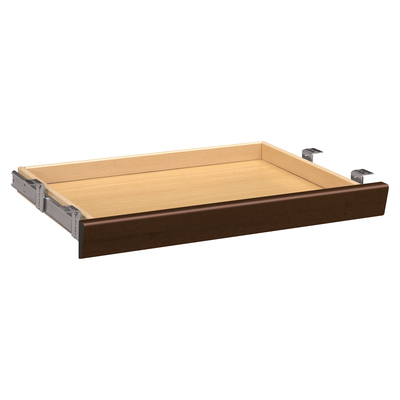 The Scratch-, Spill- And Stain-Resistant Mocha Laminate Matches Any Hon Worksurface, And Wit'Stands Daily Use..
Keep Your Entire Workstation Clean By Stowing Commonly Used Items In This Hon 26"W Laminate Center Drawer. The Drawer Glides 12" On A Smooth Ball-Bearing Suspension To Give Easy Access To All Contents. The Integrated Pencil Tray Allows You To Organize Personal Items And Utensils. The Scratch-, Spill- And Stain-Resistant Mocha Laminate Matches Any Hon Worksurface, And Wit'Stands Daily Use.